Learning about the optimization of websites can be tedious and particularly time consuming for the beginners. Those who opt to hire experts will confess that it can get costly sometimes. The alternative is to look for one of the many tools available in the market. The problem with many of these tools is the fact that many are either quite basic, or useless, giving information one would have otherwise learnt without having to purchase the tool. However, Traffic Travis is different from much of what the market has to offer, a suite of tools designed to improve the ranking of businesses in various search engines. It offers search engine optimization, keyword research, pay per click research and monitoring, as well as general website analysis jobs. Many software have free or trial versions, that can either be used for a few days, or that have limited capability and require one to upgrade to enjoy the full range of tools available. 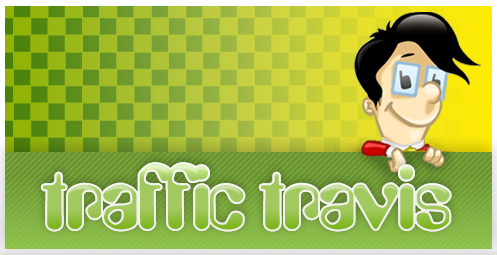 While that is certainly understandable, traffic Travis has a particularly impressive free version. In fact, one of the first things one will notice when they visit the website is that the free version is the one which is most advertised, as opposed to other vendors who mostly advertise the advance versions. This is because the developers are confident enough in the capabilities of the free version and its overall effectiveness. The free version of Traffic Travis can easily rival what many other vendors in the industry are offering as their basic plans with monthly fees. With this free version, one can do such things as keyword ranking, tracking keywords, checking backlinks for individual pages and so on. For those who would like the more advanced Pro version, though, the good news is that it is extremely affordable. The paid professional version is for those who crave a little more functionality. For the first month, one gets it at 97 dollars, after which the company will contact the user to see whether they wish to renew. 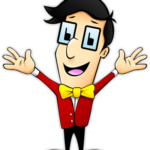 Considering the fact that many SEO tools ask for as much as 99 dollars every month for their paid versions, Traffic Travis is extremely affordable. Another advantage it brings to the table is its integration with Google Adwords. 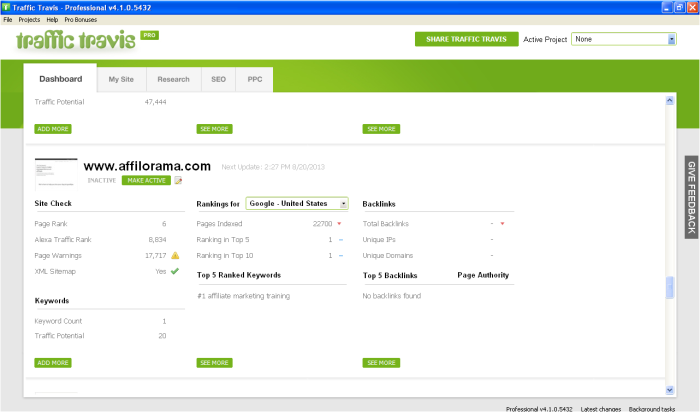 The Adword integration with the keyword research tool lets one pull keyword information straight from Google. All one has to do is connect with their Google account and the software will pull data from the Adwords, breaking it down into chunks that are easily comprehensible. Even then, there are many other tools in the industry, many of which offer much of what Traffic Travis has to offer. So what exactly does Traffic Travis bring to the table that is different from the rest? With traffic Travis, one covers all the important SEO bases. With this tool, one can perform checks on numerous pages and reveal such information as the Alexa rank, page warnings as well as Google ranking data. It can also uncover website technical mistakes, the kind that affect visibility in major search engines. This is by far the most critical advantage that the tool has as it enables individuals have the opportunity to have access to Google AdWords that are profitable. With this aspect in play, the linkage builds a setting where a user gets to identify directly with Google AdWords which makes for an effective campaign as far as SEO goes. The link also ensures that a user is able to keep updated with any developments in the AdWords that they should be adopting to make their site profitable. Beginners will be able to find this tool effective since it ensures a systematic process is established concerning the ecommerce campaign that a user wants to adopt. The simple interface gives a user the ability to navigate with ease making the internet marketing aspect workable over a short period of time. With Traffic Travis, a user gets to start up and structure a format of understanding and maximizing on Pay Per Click orientation. In the SEO world, Pay Per Click is usually the critical tool that can sustain traffic and ensure quality links are built over time. This gives a good ranking with search engines. This is a major advantage considering other tools in the niche have a costly setting. With the free basic plan, individuals are often exposed to the working processes of the tool which then prepares them for the Pro version. The affordable Pro version is one that ensures quality ecommerce is established at a cost effective state which will prove profitable in the long run. The Traffic Travis team is quite effective in facilitating customer support to ensure that users get to enjoy every single feature of the tool. Effective client support ranges from contact orientations ranging from email addresses and social media platforms. With the dedicated support areas on the download site dictating download procedures and how to integrate features, client support is covered effectively which makes for an ease of service enjoyed by the users. With the tool at hand, users get to have the capacity to create a comprehensive list of Keywords which they can use in their SE campaign. This guarantees that a user is able to monitor the effectiveness of a keyword and change or adjust their ecommerce campaign accordingly to suit the specific purpose. Users can be able to optimize web pages in line with the SEO analysis that has been conducted. This aspect gives users the ability to create an optimization platform that will work effectively to manage the ecommerce campaign. The lack of these features is a step back for this product since without them, an effective campaign is hard to master. Without backlinks and keyword management, SEO becomes ineffective since traffic cannot be monitored and the effective balance of keyword usage can also not be maximized upon. The progress of an ecommerce campaign is very crucial to a user since it is what allows them to identify the advantage they are enjoying on the search engines and how they can adjust their campaign to fit the desired setting. A lack of the journal therefore means that there is a limitation in the effective campaign process monitoring. Users utilizing Traffic Travis are limited in terms of the platforms they can be able to exploit. Users having Mac OS are simply not supported which is a letdown in terms of the potential that the tool has. Users have to target additional proxies in order to get further service from some of the features which is unfortunate considering the capacity of the tool and the investment users make.